I don’t want to dispute almost three hundred years of consensus history… Oh yes I do. There is an agreement that the grasshopper atop Peter Faneuil’s Market was chosen because he wanted the success of Gresham’s Bank in London to rub off on his market that he built for the town of Boston. goldsmith shop, that later became a bank. 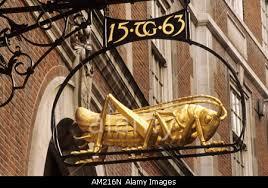 Peter who inherited his uncle’s ships and shops, might very well have been influenced by this lovely London insect. But to discover whether not this is true, one must unravel Peter himself. 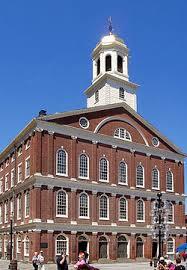 Peter Faneuil was born in 1700 into a merchant family. His brother became a landowner and farmer in Brighton and plays no part in Peter’s life. As a merchant, Peter imported Madiera, and other consumables. In the eighteenth century this meant fabrics, china, silver, carpets and foods like cheeses and nuts. This made him a very rich man, especially when he inherited his uncle’s money. There is a theory about his uncle’s insisting Peter not marry or he would not inherit, but I suspect that Peter’s not marrying came from other inclinations. When Peter was in his early twenties he helped a duelist escape from the watch. The men did not know it, but the victim died of blood loss and cold on Boston Common, while Peter took the perpetrator to New York on his ship. Today we would call Peter a party boy, and he would have hung out with the Kardishians or the Kennedy’s, other rich kids who did not have to work for their money, though might occasionally do something for society like build a marketplace. For which I commend him by the way. In those days they probably called him a fop. Recently I had occasion to research the school curricula used in the eighteenth century, and discovered that although all boys learned some Latin, only those who could afford to stay in school past the sixth grade would have studied Greek. Peter would have been one of those schoolboys, and among the things he would have read were Aesop’s Fables. Included in those fables is the Ant and the Grasshopper. Briefly, the any works and works while the grasshopper fiddles the summer away. It ends poorly for the grasshopper, but it is possible that young Peter did not read to the end of the story, or maybe he did, because he was ill with heart problems and died in 1742 the year the marketplace was opened. I like to think that the golden grasshopper might be Peter Faneuil, high above his marketplace watching all the hardworking men and women selling their wares. But maybe hundreds of years of consensus history was right. 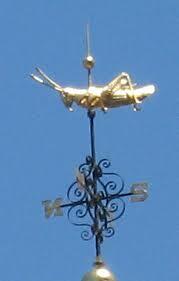 By the way the weathervane was designed by Shem Drowne in 1742.